As is the case when selecting lighting for any room in your home, an important thing to consider is the design and layout of that space. The illumination of a room affects our perception of space proportions as light reflects from various surfaces including the walls, floor, and ceiling. 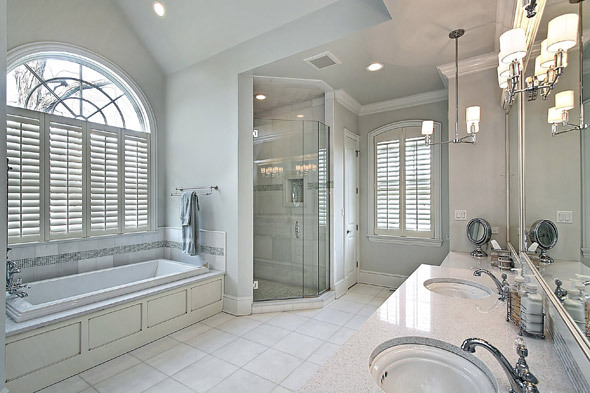 Most often for bathrooms, we want to make the space seem larger or wider. To create the illusion of a larger bathroom using lighting, select décor and furnishings with reflective surfaces. Keep in mind that a substantially lighter color on the ceiling (compared to the walls) visually lifts the room, creating the illusion of a higher ceiling. Dark floors create the illusion of a dropped floor, instantly lengthening the room. By directing lighting upward and keeping light saturation on the walls, you can visually expand your bathroom. When choosing lighting for your bathroom it’s important to remember that optimal lighting has 3 layers: general/ambient lighting, task lighting, and accent lighting. Layering light creates a tranquil atmosphere while having a function and purpose. The first layer is general light. This layer of light illuminates a wide or general area. Ceiling lighting or overhead lighting is typically used to create this first layer. With ceiling lighting, keep in mind that the farther away light is, the larger the surface area that’s illuminated. For recessed lighting, consider a spotlight bulb as opposed to a floodlight bulb for a more even distribution of light. If ceiling height is not an issue, consider creating a chic or luxurious feel in your bathroom by adding a chandelier over the tub. The width of the chandelier should be twice the width of the room, but in inches rather than feet (a 12 foot wide room should have a chandelier no wider than 24 inches in diameter). Task lighting is the second layer of light to consider for your bathroom. It illuminates specific areas as opposed to the general area. The most popular type of task lighting for the bathroom is vanity lights. When selecting bulbs for your vanity, keep in mind that the amount of light released into the bathroom is directly proportional to the clarity of the bulb. Frosted bulbs will cast less light than clear bulbs (depending on the paint job in your bathroom that might not be such a bad thing). The final layer of bathroom lighting is accent lighting. This layer sets the mood of a room and can be used to draw focus toward its pleasant features while making the room seem larger. As an example, indirect or accent lighting could be used to highlight crown molding on the ceiling. By choosing a light ceiling color and directing light upwards, you can instantly add length to your space. Layering light is multifunctional as it helps create a soothing environment while providing task specific illumination. Be mindful of small and large details of your bathroom’s décor, as this can affect our perception of space proportions. Bellacor is a one-stop showroom that promises a new way to shop the entire lighting and home furnishings industry from the comfort of your home by providing superior personal service and access to the largest collection of lighting and home furnishings on the web. Bellacor offers access to over 500,000 products from 700 manufacturers.